AOR Guarantees: that no ingredients not listed on the label have been added to the product. Contains no citrus, wheat, gluten, corn, nuts, dairy, soy, eggs, fish, shellfish or any animal byproduct. Quercetin belongs to the flavonoid class of antioxidants commonly found in citrus fruits. Its use has been widely established, particularly in Europe, for the treatment of a variety of ailments including allergy symptoms, diabetic complications and cardiovascular concerns, all thanks to its anti-inflammatory effects. Primary Uses: Quercetin promotes cardiovascular health due to its antioxidant and anti-inflammatory effects. It reduces the oxidation of low density lipoproteins (LDL), promotes healthy blood pressure and blood clotting, enhances nitric oxide (NO) production, and reduces the risk of metabolic syndrome. Secondary Uses: Quercetin inhibits the production of inflammatory signaling molecules by a mechanism similar to that of aspirin. 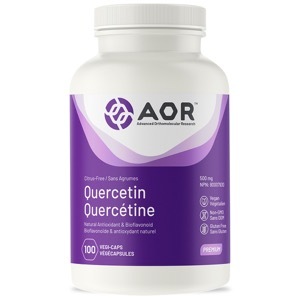 Quercetin also inhibits the release of histamine from certain immune cells and is therefore widely used by those who suffer from constant allergies (such as dust) and seasonal allergies (such as hay fever). Quercetin can add a boost for anyone at risk or suffering from any cardiovascular condition, battling allergies or plagued with headaches. Take 1-3 capsules daily, or as directed by a qualified health care practitioner. A. P. Rogerio1, A. Kanashiro, C. Fontanari1, E. V. G. da Silva1, Y. M. Lucisano-Valim, E. G. Soares3 and L. H. Faccioli1Anti-inflammatory activity of quercetin and isoquercitrin in experimental murine allergic asthma. Infl amm. res. 2007;56:402-408. Ansari MA, Abdul HM, Joshi G, Opii WO, Butterfield DA. Protective effect of quercetin in primary neurons against Abeta(1-42): relevance to Alzheimer's disease. J Nutr Biochem. 2008 Jul 3. Arena A, Bisignano G, Pavone B, et al. Antiviral and immunomodulatory effect of a lyophilized extract of Capparis spinosa L. buds. Phytother Res. 2008 Mar;22(3):313-7. Barger JL, Kayo T, Pugh TD, Prolla TA, Weindruch R. Short-term consumption of a resveratrol-containing nutraceutical mixture mimics gene expression of long-term caloric restriction in mouse heart. Exp Gerontol. 2008 Sep;43(9):859-66. Bischoff SC. Quercetin: potentials in the prevention and therapy of disease. Curr Opin Clin Nutr Metab Care. 2008 Nov;11(6):733-40. Chun OK, Chung SJ, Claycombe KJ, Song WO. Serum C-reactive protein concentrations are inversely associated with dietary flavonoid intake in U.S. adults. J Nutr. 2008 Apr;138(4):753-60. Cruz EA, Da-Silva SA, Muzitano MF, et al. Immunomodulatory pretreatment with Kalanchoe pinnata extract and its quercitrin flavonoid effectively protects mice against fatal anaphylactic shock. Int Immunopharmacol. 2008 Dec 10;8(12):1616-21. Edwards RL, Lyon T, Litwin SE, et al. Quercetin reduces blood pressure in hypertensive subjects. J Nutr. 2007 Nov;137(11):2405-11. Ghosh HS. The anti-aging, metabolism potential of SIRT1. Curr Opin Investig Drugs. 2008 Oct;9(10):1095-102. Johri RK, Zutshi U, Kameshwaran L, Atal CK. Effect of quercetin and Albizzia saponins on rat mast cell. Indian J Physiol Pharmacol. 1985 Jan-Mar;29(1):43-6. Lekakis J, Rallidis LS, Andreadou I, et al. Polyphenolic compounds from red grapes acutely improve endothelial function in patients with coronary heart disease. Eur J Cardiovasc Prev Rehabil. 2005 Dec;12(6):596-600. Machha A, Achike FI, Mustafa AM, Mustafa MR. Quercetin, a flavonoid antioxidant, modulates endothelium-derived nitric oxide bioavailability in diabetic rat aortas. Nitric Oxide. 2007 Jun;16(4):442-7. Martin CK, Anton SD, Han H, et al. Examination of cognitive function during six months of calorie restriction: results of a randomized controlled trial. Rejuvenation Res. 2007 Jun;10(2):179-90. Min YD, Choi CH, Bark H, et al. Quercetin inhibits expression of inflammatory cytokines through attenuation of NF-kappaB and p38 MAPK in HMC-1 human mast cell line. Inflamm Res. 2007 May;56(5):210-5. Min YD, Choi CH, Bark H, Son HY, Park HH, Lee S, Park JW, Park EK, Shin HI, Kim SH. Quercetin inhibits expression of inflammatory cytokines through attenuation of NF-kappaB and p38 MAPK in HMC-1 human mast cell line. Inflamm Res. 2007 May;56(5):210-5. Moon H, Choi HH, Lee JY, et al. Quercetin inhalation inhibits the asthmatic responses by exposure to aerosolized-ovalbumin in conscious guinea-pigs. Arch Pharm Res. 2008 Jun;31(6):771-8. Mu C, Jia P, Yan Z, Liu X, Li X, Liu H. Quercetin induces cell cycle G(1) arrest through elevating Cdk inhibitors p21 and p27 in human hepatoma cell line (HepG2). Methods Find Exp Clin Pharmacol. 2007 Apr;29(3):179-83. Pearce FL, Befus AD, Bienenstock J. Mucosal mast cells. III. Effect of quercetin and other flavonoids on antigen-induced histamine secretion from rat intestinal mast cells. J Allergy Clin Immunol. 1984 Jun;73(6):819-23. Rivera L, Moron R, Sanchez M, Zarzuelo A, Galisteo M. Quercetin ameliorates metabolic syndrome and improves the inflammatory status in obese zucker rats. Obesity (Silver Spring). 2008 Sep;16(9):2081-7. Ruiz PA, Braune A, HÖlzlwimmer G, Quintanilla-Fend L, Haller D. Quercetin inhibits TNF-induced NF-kappaB transcription factor recruitment to proinflammatory gene promoters in murine intestinal epithelial cells. J Nutr. 2007 May;137(5):1208-15. Stewart LK, Soileau JL, Ribnicky D, et al. Quercetin transiently increases energy expenditure but persistently decreases circulating markers of inflammation in C57BL/6J mice fed a high-fat diet. Metabolism. 2008 Jul;57(7 Suppl 1):S39-46.